Boeing and the 418th Flight Test Squadron are conducting Ground Effects and Fuel Onload Fatigue testing on the new KC-46. 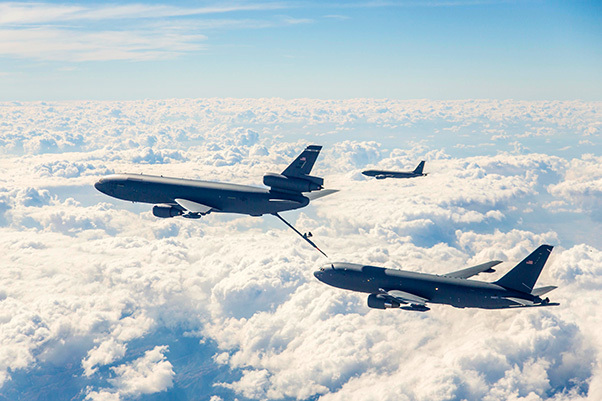 Fuel Onload Fatigue is gathering data to characterize the aircraft interaction typically experienced when the KC-46A is flying in receiver formation behind a current KC-135 or KC-10 tanker. While the KC-46s role is to refuel other aircraft, it itself may need refuel from other KC-10s or KC-135s to extend its range. Fuel Onload Fatigue testing is the first look at the KC-46 acting in that role. The KC-46 program’s first test aircraft, a Boeing 767-2C (EMD-1), departed from its home at Boeing Field in Seattle and touched down at Edwards for the first time Oct. 15. The plan is to have the 767-2C here for about two weeks. Boeing and the 418th Flight Test Squadron are conducting Ground Effects and Fuel Onload Fatigue testing on the new tanker. Ground Effects testing is to gather aerodynamic data for updating the KC-46A simulator as well as supporting FAA civil certification. 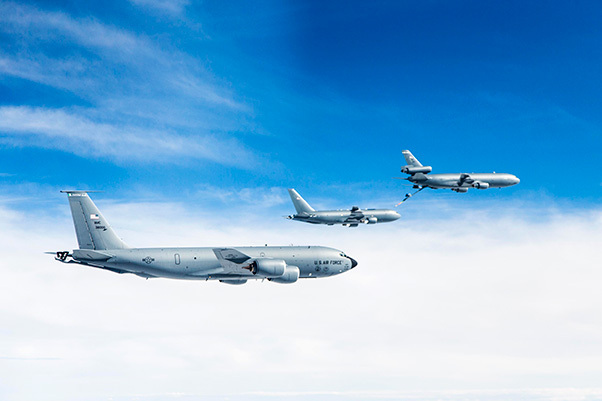 Fuel Onload Fatigue is gathering data to characterize the aircraft interaction typically experienced when the KC-46A is flying in receiver formation behind a current KC-135 or KC-10 tanker. While the KC-46s role is to refuel other aircraft, it itself may need refuel from other KC-10s or KC-135s to extend its range. Fuel Onload Fatigue testing is the first look at the KC-46 acting in that role. The KC-46 tanker program’s first test aircraft, a Boeing 767-2C (EMD-1), departed from its home at Boeing Field in Seattle and touched down at Edwards for the first time Oct. 15. As throughout history, Edwards continues to be the premier base for flight testing the Air Force’s newest capability. Neidorff said Boeing and Air Force pilots have been operating as combined crews through all of the testing at Edwards including the ferry flight from Seattle. Several units from both on and off base are supporting the testing. The 412th Test Engineering Group is providing special instrumentation support. The 416th Flight Test Squadron is providing chase aircraft support. The 370th Flight Test Squadron is providing KC-135 tanker crew support. The 92nd Air Refueling Wing based at Fairchild AFB, Wash., is providing the KC-135 and maintenance support. The 60th Air Mobility Wing out of Travis AFB, Calif., is providing the KC-10 and maintenance personnel. 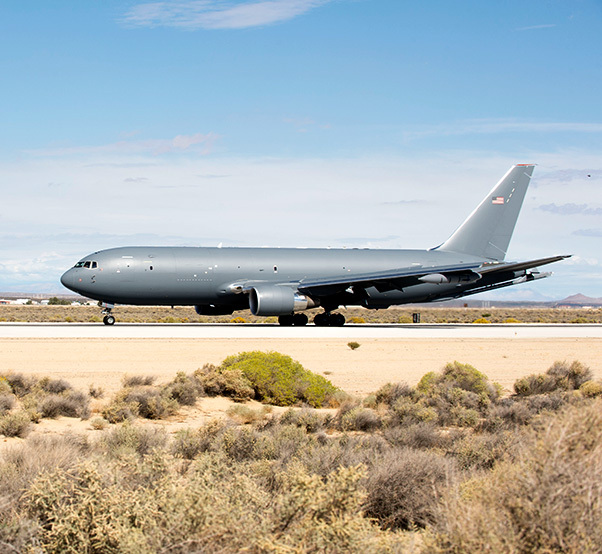 According to Neidorff, the KC-46A will return to Edwards AFB to accomplish testing in the Benefield Anechoic Chamber as well as conduct aerial refueling certifications. The KC-46A Pegasus is intended to replace the U.S. Air Force’s aging tanker fleet, which has been refueling aircraft for more than 50 years. With more refueling capacity and enhanced capabilities, improved efficiency and increased capabilities for cargo and aeromedical evacuation, the KC-46A will provide aerial refueling support to the Air Force, Navy, Marine Corps as well as allied nation coalition force aircraft. 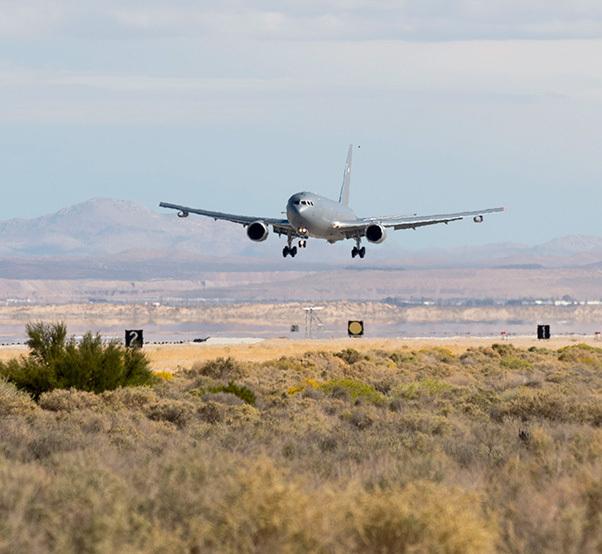 The 412th Test Wing at Edwards Air Force Base, Calif., is the lead developmental test organization for the KC-46 program.